Calling all makeup mavens, fragrance fanatics, skincare enthusiasts and beauty addicts! SEPHORA is opening its doors in Newport on May 20, 2016. 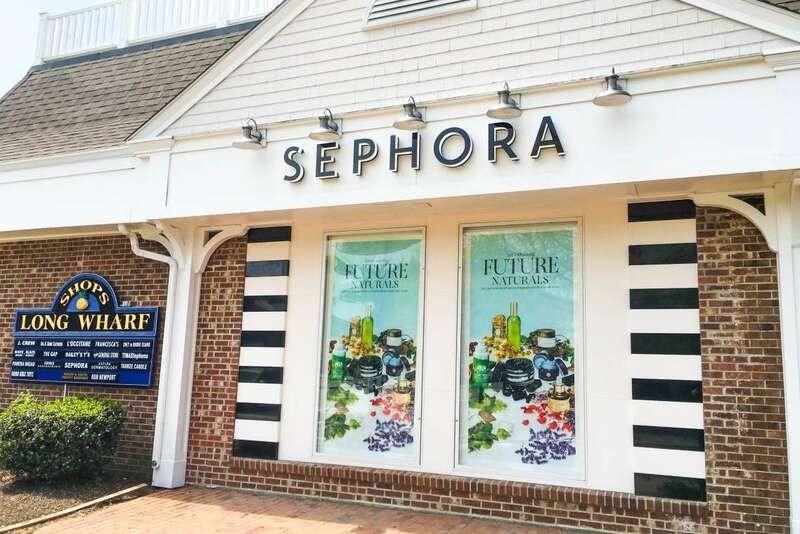 The new 3,880 square foot, free-standing SEPHORA store at The Shops at Long Wharf Mall is a paradise of endless beauty options with over 13,000 products from more than 200 brands, including SEPHORA’s own collection of makeup, skincare, tools and accessories, SEPHORA COLLECTION. Makeup and nail lines such as Benefit, Bite Beauty, Cover FX, FORMULA X, Hourglass, Kat Von D Beauty, MAKE UP FOR EVER, Marc Jacobs Beauty and NARS will be available, as well as innovative skincare lines like Caudalie, Dr. Dennis Gross Skincare, Fresh, and Ole Henriksen. Fragrance fanatics can enjoy offerings from Atelier Cologne, Marc Jacobs, Philosophy and Stella McCartney. The SEPHORA retail concept is rooted in aesthetics, presenting our clients with the most unique product assortment, store design and client services. SEPHORA was the first beauty retailer to employ the unique open-sell philosophy, allowing clients to shop a myriad of brands and encouraging them to try, test and play with everything from lip glosses to blushes, skincare to fragrance. At SEPHORA, discover a world where prestige cosmetics are showcased in gorgeous open displays for clients to have the freedom to explore and sample at leisure. Must-Have of the Moment: Unparalleled hydration. Unprecedented brightening. The next generation of skincare innovations is here, and these products from brands like Boscia, Farmacy and Sunday Riley draw their power from natural resources. Reap the benefits of nutrient-rich ingredients that have been handpicked, air-dried, and cold-pressed to unlock exceptional potency and deliver maximum results. This is the innovation of modern beauty craftsmanship. These are the creams of the crop. Mini Makeover services include: Smoky Eye, Contour, Polished Brows, Everyday Eye, Essential Eyeliner, Flawless Foundation, Correct + Conceal, Blush + Bronze, Perfect Lips and False Lash Application. With a Custom Makeover, get the look you want, for every day or a special event, custom-created in a private 60-minute makeup session with an expert artist. Plus, get tips and techniques to recreate it on your own. Minimum $50 purchase required. Master a new look and the latest beauty trends with Sephora Beauty Classes! A safe place to learn and play, it’s where you can get really creative with beauty. To learn more about our newest class, No-Makeup Makeup and other classes offered, go to Sephora.com/class. Get privileged! Get rewarded! Get personal! Join Beauty Insider today to get access to Insider-only products, exclusive samples, birthday gifts and an all-access pass to personalized beauty. Already a member? Update your SEPHORA status and become part of the premium rewards program, Very Important Beauty Insider (VIB). Not only will you receive all the fabulous BI perks, VIB status will also grant you additional benefits, from large in-store and online discounts to free VIB-only beauty bonuses and an invite to a private Holiday Shopping Party. The VIB ROUGE level, the premium membership level for the most fervent product junkies, offers unparalleled insider access to one-of-a-kind experiences and rewards like limited-list events with brand founders and celebrities, advance access to new products, free shipping on Sephora.com, unlimited complimentary services at the SEPHORA Beauty Studio and your own beauty concierge hotline. It’s a birthday celebration for you and SEPHORA Newport! It may be SEPHORA’s birthday in Newport, but the celebration doesn’t stop at the store opening. As a Beauty Insider at any level, you’re also eligible to receive a special gift from Marc Jacobs Beauty or a skincare gift from Fresh! Check your e-mail, mail or simply come back to SEPHORA Newport or any other SEPHORA location, within two weeks of your birthday to pick up the special gift SEPHORA has waiting for you!